Rosa × damascena, more commonly known as the Damask rose, or sometimes as the Rose of Castile, is a rose hybrid, derived from Rosa gallica and Rosa moschata. Further DNA analysis has shown that a third species, Rosa fedtschenkoana, is associated with the Damask rose. The flowers are renowned for their fine fragrance, and are commercially harvested for rose oil (either "rose otto" or "rose absolute") used in perfumery and to make rose water and "rose concrete". The flower petals are also edible. They may be used to flavor food, as a garnish, as an herbal tea, and preserved in sugar as gulkand. The Damask rose is a deciduous shrub growing to 2.2 metres (7 ft 3 in) tall, the stems densely armed with stout, curved prickles and stiff bristles. The leaves are pinnate, with five (rarely seven) leaflets. The roses are a light to moderate pink to light red. The relatively small flowers grow in groups. The bush has an informal shape. It is considered an important type of Old Rose, and also important for its prominent place in the pedigree of many other types. A still popular example of R. × damascena is the Ispahan rose. The hybrid Rosa × centifolia is derived in part from Rosa × damascena, as are the Bourbon, Portland and Hybrid Perpetual classes. The cultivar known as Rosa gallica forma trigintipetala or Rosa damascena 'Trigintipetala' is considered to be a synonym of Rosa × damascena. Celsiana is a repeat flowering semi-double variety. Rosa × damascena is a cultivated flower, no longer found growing wild. Its origins were traditionally thought to have been in the Middle East, though recent genetic tests indicate it is a hybrid of (R. moschata x R. gallica) crossed with the pollen of Rosa fedtschenkoana, suggesting that a more probable origin is the foothills of central Asia, home of its pollen parent. The Crusader Robert de Brie is sometimes given credit for bringing the Damask rose from Syria to Europe sometime between 1254 and 1276. The name refers to Damascus, Syria, a major city in the Middle Eastern region. Other stories say the Romans brought the rose to England, and a third account says that the physician of Henry VIII gave him a Damask rose, as a present, around 1540. There is a history of fragrance production in Afghanistan (Kabul Province) from the Damask rose. An attempt has been made to restore this industry as an alternative for farmers who currently produce opium. Rosa × damascena is best cultivated in hedge rows to help protect the blooms from wind and to facilitate ease of picking. Gathering the flowers is quite labor-intensive as it must be done by hand. There are about twenty to forty days per year when harvesting occurs, depending on the type of Rosa × damascena cultivated in the region. The roses are gathered by hand and brought to a central location for steam distillation. Bulgaria and Turkey are the largest producers of rose oil from the different cultivars of Rosa × damascena. France and India also contribute significantly to the world market. Morocco, Tunisia and some other Middle Eastern countries have historically produced rose oil, but their modern contribution is minimal. The town of Kazanlak in Bulgaria was founded in 1420. It is assumed by most historians that the cultivation of the Kazanlak Rose began around that period. Rosa × damascena, known in this region as the Kazanlak Rose, were reportedly brought to the area by a Turkish judge who brought them from Tunisia and cultivated them in his own fragrant garden, and is now cultivated for commercial use in an area surrounding Kazanlak called the “Valley of Roses.” The distillate from these roses is sold as ‘Bulgarian Rose Oil”, and “Bulgarian Rose Otto”. Turkish rose oil is sold as “Rose Oil”, “Turkish Rose Otto” and "Rosa Damascena Attar”, or “Ittar’ in similar languages. While there are still families who run their own small distilleries and produce what is known as “village oil”, the commercialization of Rose Oil as a high quality product is carefully regulated through a state-run cooperative in the Isparta region of Turkey. The Roses are still grown by the small family farms but the flowers are brought to one of many stills set up and regulated by the cooperative for distillation and quality control. India has also developed an industry producing Rose Oil (both Rose Attar and Rose Absolutes) as well as Rose Concrete. Perhaps due to the low labor cost and the commitment of the Indian Government to international trade and high quality standards, these products from India today are cheaper than those from Bulgaria and Turkey. The city of Taif in Saudi Arabia is famous for the cultivation of this flower, which is called "Ward Taifi". Damascus roses are used in cooking as a flavouring ingredient or spice. It appears as one of the ingredients in the Moroccan spice mixture known as ras el hanout. Rose water and powdered roses are used in Persian, Indian, and Middle Eastern cooking. Rose water is often sprinkled on meat dishes, while rose powder is added to sauces. Chicken with rose is a popular dish in Persian cuisine. Whole flowers, or petals, are also used in the herbal tea "zuhurat". The most popular use, however, is in the flavoring of desserts such as ice cream, jam, Turkish delights, rice pudding, yogurt etc. Western cookery today does not make much use of roses or rose water. However, it was a popular ingredient in ancient times and continued to be popular well into the Renaissance. It was most commonly used in desserts, and still is found as a flavour in traditional desserts such as marzipan or turrón. It has seen some revival in television cooking in the twenty-first century. 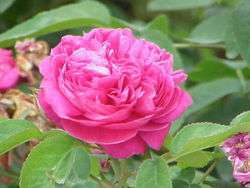 Pharmacological effects of extracts from flowers from Rosa damascene have been the subject a number of scientific studies. A review article published in 2011 summarised these studies. For centuries, the Damascus rose (Rosa damascena) has been considered a symbol of beauty and love. The fragrance of the rose has been captured and preserved in the form of rose water by a method that can be traced back to ancient times in the Middle East, and later to the Indian subcontinent. Wikimedia Commons has media related to Rosa × damascena. ↑ "Rosa ×damascena". Natural Resources Conservation Service PLANTS Database. USDA. Retrieved 1 February 2016. 1 2 Huxley, A., ed. (1992). New RHS Dictionary of Gardening. Macmillan.